Certainly not everything about a subject where the underlying science is developing as fast as in the field of genetics. And particularly not everything about a subject where the underlying science is developing as fast as in the field of genetics and its application to what we do in genealogy. It’s an almost every-day occurrence these days that something new is learned about how genes are passed from generation to generation and how those markers can — or can’t — be used to help us identify relationships and document our family trees. And nobody — no one single person — can possibly keep up with it all. Which is a very long way of saying that you, Dear Reader, aren’t getting the whole story with a once-a-week blog post from yours truly, The Legal Genealogist, who, as that moniker may suggest, isn’t a geneticist anyway. Fortunately, our genealogical community is blessed with a fair number of folks who know their stuff in this area and whose work is readily available, free, in their blogs. Blaine Bettinger has a Ph.D. in biochemistry with a concentration in genetics and a law degree. When he’s not handling patent law questions for the law firm where he works, he’s chasing genetic genealogy questions for his blog. 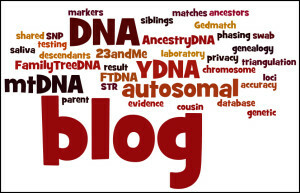 Main author of the free guide I Have The Results of My Genetic Genealogy Test, Now What?, he has been blogging as The Genetic Genealogist since 2007. Rebekah Canada says she fell in love with genealogy when she was seven, combining “many bags of pogan ginger cookies” with “the women of Colonial New England.” In the years since then, she has become the go-to person for genetic genealogy projects and her current interests include minority population heritage, personal genomics education, and project administration best practices. She’s worked with the Genographic Project and with Family Tree DNA particularly clarifying the frequently asked questions, and launched Haplogroup in May of this year. Roberta Estes is both a scientist and, in her own words, “an obsessed genealogist.” She manages a number of DNA-related volunteer projects, including the Lost Colony DNA research projects and regional Cumberland Gap Yline and mitochondrial DNA projects, co-administers several Native American and African DNA projects and serves in an advisory capacity for the Melungeon project and other groups. An expert in Native American heritage, she began writing DNAeXplained – Genetic Genealogy in 2012, celebrating the blog’s first anniversary just a few days ago. Debbie Cruwys Kennett is the lone international entry to the field, writing from England with the strength of years of experience managing her own Cruwys Surname Project and working with the Guild of One Name Studies. She is the author of two books, Social Networking: A Guide to Genealogy in the Twenty-First Century, published in 2011, and The Surnames Handbook, published in 2012, both by The History Press. She’s been writing Cruwys News since 2007. Last but far from least is CeCe Moore, an independent professional genetic genealogist whose focus is on autosomal DNA testing. She’s the Southern California regional coordinator for the International Society of Genetic Genealogy (ISOGG), moderator for the ISOGG DNA Newbie List, administrator of several DNA projects, and administrator of or advisor to numerous adoption-related DNA groups. She began the Your Genetic Genealogist in 2010. One other I’d recommend that’s not exactly for mainstream genealogists, but then you can see why The Legal Genealogist would have to add this one, is the Genomics Law Report, written by the law firm of Robinson Bradshaw & Hinson of Charlotte, North Carolina. It’s good. Really. So go on. Add these to your blog-reader program or service. It’s the only way to even try to keep up with all that’s going on in genetic genealogy. Judy – thanks so much for the nice mention and recommendation. We are very fortunate to have such a great collaborative community. We sure are, Roberta! Good to have folks like you to rely on! So helpful, Judy. I really appreciate your way of recommending the experts to those of us trying to figure this complicated and exciting resource! Merci! You won’t go wrong with any of them, Celia. Great post! Just what we need to dig a little deeper into the subject, particularly when one is at the “now that I have tested and am getting feedback, what do I do next?” stage. Thanks for the kind words, Bruce! Judy: A great service to all of us who have an interest but not the base of knowledge to fully appreciate this fast emerging area of genealogy. Thank you!! Glad to point you (and us all) in the right direction, John! You (and the others) deserve the mention, CeCe! Thanks so much for this list of your recommendations on the subject. Having just begun pursuing DNA testing for my family research, I see such a steep learning curve ahead! Taking bite-sized pieces as each of these bloggers post makes progress seem more manageable. Glad to help steer you in the right direction, Jacqi! Judy, thank you for the great list of resources. I have been following a couple of them, but I hadn’t found your blog until I saw the posting on the ISOGG Facebook page. As a recovering attorney, how could I resist taking a look at The Legal Genealogist? I have been working on my genealogy & family history since 1978, but didn’t go to law school until 1990, sort of a midlife crisis I guess. Got out of the practice of law after a few years, but I’ve never managed to escape from genealogical research. I am really intrigued by what I may be able to learn from DNA, a fascinating area with so much to learn. Welcome to another “recovering” attorney, John! (I haven’t actively practiced for some time!) Yes, DNA offers a lot of promise to those willing to put in the effort. Thank you Judy for giving me a mention. I am very honoured to appear in such illustrious company. We are very fortunate that we have such a wonderful genetic genealogy community. This is a wonderful resource! Thank you, Judy! When we undertake DNA testing in our family, which will be fairly soon, we will know how many experts are available to call upon. I’m tucking away this list! Glad this came in handy, Mariann!